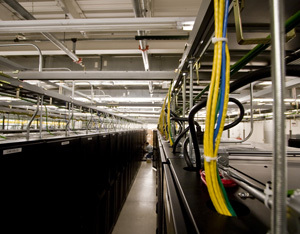 An overview of the data center space housing the majority of our clients. 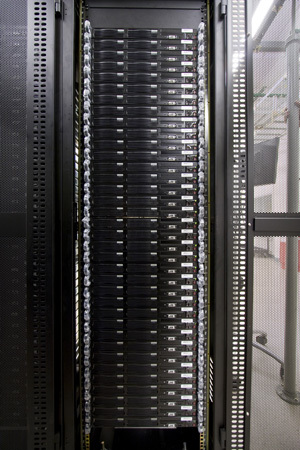 The server Aisles are separated between hot Aisles and cold Aisles. This is a view down the hot Aisle between rows 206 and 207. The Aisle is warm because the servers case and CPU fans all blow into it. Strict control over airflow helps us keep efficiency high and costs down while minimizing our environmental impact. This is an open server rack on the "hot" side. There are very strict wiring requirements. Proper wiring insures not only employee safety but proper airflow, which is essential to maintain an environmentally friendly facility by minimizing use of resources for climate control. 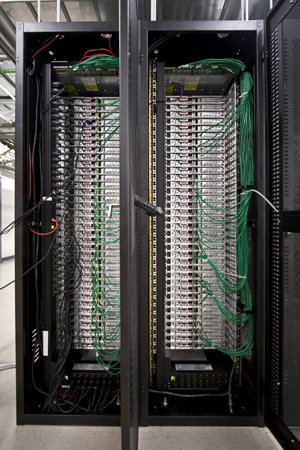 Here is a full server rack with over 35 servers in it. 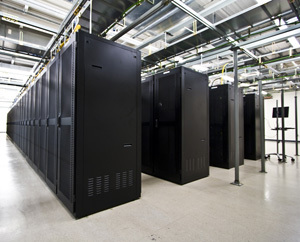 To conserve power, servers are not turned on until they are leased to a client. We maintain and monitor our networking equipment very carefully. Only senior staff is allowed access to it and it is kept under a special lock and key. We also have a special security camera focused on both sides of this cabinet. 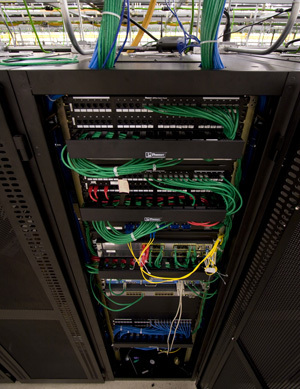 We have additional networking material in every server rack and also off-site at the Equinix IBX center as a POP location.